The inexorable rise of air travel and the shrinking of our world in terms of accessibility have meant the demand for airports has risen sharply in the last fifty years. Here Project Director Alistair Brierley explores the ever changing experience of airline passengers and the importance of cultural influences on airport design. At any one moment 800,000 people are flying in aircrafts. How many is this per day, per month or year? Gone is the romantic world of flight with the glamour and mystery that surrounded it. From the Wright brothers through to Amy Johnston, BOAC and BEA the world has moved on, and these individuals and proud airlines are now distant memories. During the early twentieth century Fritz Lang in his film ‘Metropolis’, Marinetti in the Futurist manifesto, St Elia the young Italian visionary with his drawings, and eventually Saarinen at TWA in New York captured the purity, exhilaration and excitement of speed and flight in their work. Nowadays the notion of flight and architectural metaphors or signifiers are largely abandoned by architects. Saarinen’s poetic TWA terminal, with its swooping curves is virtually a museum piece and in terms of the pressures of its New York context cannot cope with the 21st century version of air travel. The building is now redundant as a terminal. Although contemporary airports are growing rapidly in scale and ambition (and are fast becoming ‘nation- states’ in their own right), remnants of the past still survive and a handful of airfields from the early and mid-twentieth still operate. They are to an extent recognised as anachronistic and an inefficient indulgence. Giovanni Nicelli, set on the Lido in Venice is a striking building from 1935, complete with a grand piano in the lobby and Futurist murals providing the décor along with the possibilities of arriving by bike or boat. Courcheval in the French Alps is little more than a wooden hut constructed in 1961, and Barra Airport in Scotland is dependent on the tides as the adjacent beach provides the runway’. The atmosphere generated in these small and unique locations allows us to experience flying and the natural world more closely. The passenger always approaches the aircraft on foot across the apron. This opportunity is now rare and unless an airport is oversubscribed and has inadequate gate provision the chance to walk alongside the giant fuselage and board via step access has gone. Indeed aircraft are becoming less visible to the passenger. It is now possible to arrive on an underground train link, progress from ‘landside’ to ‘airside’ and board an aircraft whilst barely seeing the airfield and the sky. This says little for the enhancement of the passenger experience. Airports are now focused on their retail offer and the ‘mall’ has become a ubiquitous element of contemporary facilities. At Istanbul Grand Airport where Scott Brownrigg is engaged as Lead Designer for this mega hub (eventually to process 150 million passengers a year) there is over one million square feet of retail planned for the building as well as a large hotel. This enormous facility on the Black Sea coast is a game changing move from Turkey in terms of global aviation. The economic growth and facilities that will arrive with its development aim to deliver what amounts to an instant ‘pop-up’ city. A place with no history or context, liberated from the past. Some find this concept depressing and claim that these places are without soul, cultural texture or depth. There is nothing that resonates or fires the imagination of the passenger. Others such as JG Ballard, the visionary writer find these places energising. He lived for many years on the fringes of Heathrow airport and delighted in the ‘alienation, transience and discontinuities that responded to the pressures of speed, disposability and instant impulse. ‘He identified airports as a new kind of ‘discontinuous’ city where the individual is ‘no longer bound by civic obligations. The crowds that flow forever are always just passers-by; they are never neighbours or property owners or people with a claim to anonymity or privacy. They are by definition random and unpredictable. Specific types or events or attitudes or experiences cannot be anticipated. An easy camaraderie rules the departure lounges along with the virtual abolition of nationality. This debate raises the issue of airports and their cultural identity. 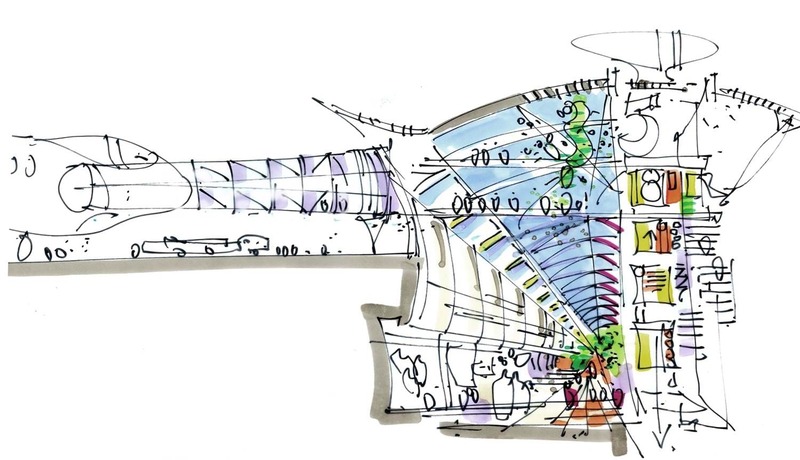 Why bother to impose expressive architectural metaphor to an international airport proposal? These buildings are after all gateways into individual nations and a sense of pride may demand that such significant ‘portals’ advertise and declare their cultural hand. Well-handled these narratives can work and integrate with the architecture to create a great building, but the question still remains - are these narratives forced and derivative? At Istanbul, Scott Brownrigg has used a contemporary version of the Ottoman vault to recognise an inherent quality of Constantinople, whilst in Medina the palm became the key motif for the architectural and structural expression. Sixty tonne prefabricated tree structures spanning 36 metres were craned onto site to support the intricate roof above the ‘processor’, whilst solar shading based on palm fronds ameliorate the effects of low east and west sun. Tented structures reference the Bedouin history of the region, and a large mosque forms part of the landside infrastructure. 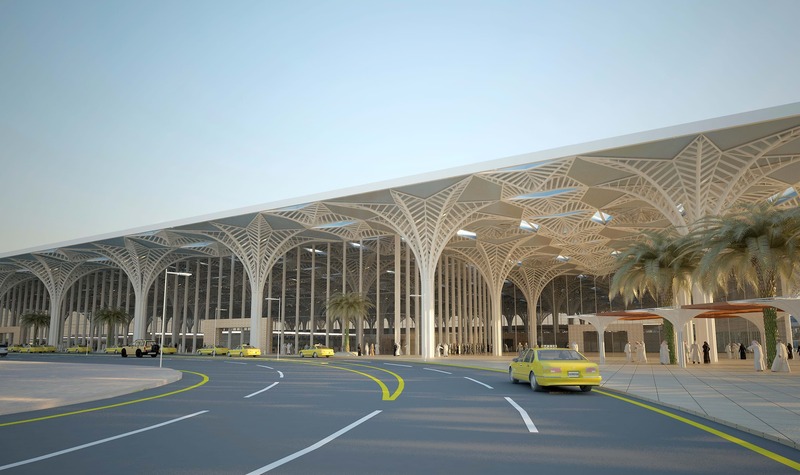 Add to this the fact that Medina was built and designed as a facility for Hajj pilgrims, (inexperienced flyers who surge through the facilities at specific times of year) and it can be seen that the cultural references for airport design don’t just acknowledge local history in their architectural expression, but also in their planning. Conversely Ballard had no time for the past and looked forward. He recognised that for the operator the airport terminal is a means to an end. Its purpose is to process passengers, and as many as possible. This is an efficient and ruthless money making machine, dictating that the plan of both the terminal, and the capacity offered by the configuration and flexibility of the departure gates are paramount and central to long term success. The success of stylistic gestures is harder to evaluate. An apparent contradiction to the speed and efficiency of ‘processing’ now lies in the retail and leisure components that are increasingly apparent in large airports. Here we are creating a world of temporary ‘stage-sets’ within their more fixed shell and core construction. In terms of ‘fit-out’ almost anything goes as long as it is branded and themed. 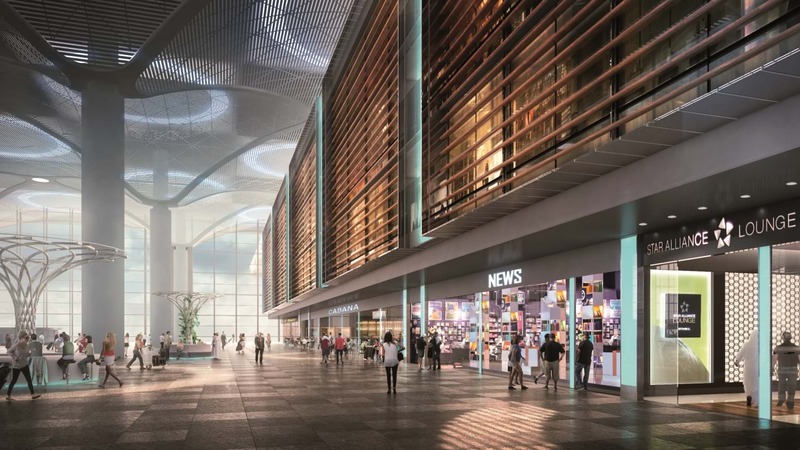 Larger airports are now offering hotel and office facilities within their terminals as well as luxurious gardens, a host of restaurants and increasingly exotic retail offers. This means that the airport can now hold and contain visitors for days rather than hours. 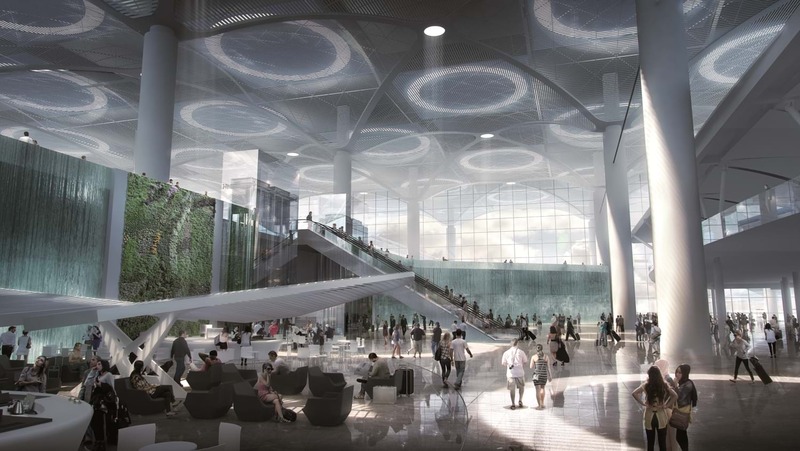 ‘Super-hubs’ like Istanbul will aim to retain passengers for longer periods of time where they can use the ready-made vacation facilities on offer and add to their profitability. In submitting a competition entry for Long Thanh in Vietnam, Scott Brownrigg has referenced Vietnamese culture in their entry and developed the design around the specific character and personality of this country. The form of the building references and respects the vernacular traditions that have informed Vietnamese architecture through the centuries. Climate has been a fundamental consideration for the Vietnamese builder. Form and function combined with the availability of specific local materials has led to a great tradition of roof construction offering shade and shelter, as well as a response to the heavy rainfall of the monsoon season. The competition entry has learnt from these traditions whilst interpreting them in a modern and contemporary manner. The undulations of the roofs whilst controlling rainwater run-off in the wet season, reference the sinuous terraces of the indigenous landscape, the undulations of fluttering silk ribbons and the curvatures of a dragons’ back. All in all the architectural form of the competition entry synthesises and distils the unique sense of place embodied in contemporary Vietnam and expresses it in a strong but abstract statement that embodies the culture of this unique country. As our world moves faster and it is increasingly hard to hold on to a sense of individualism and identity there is a growing need amongst people for a cultural thread or narrative to inform and richen their lives. Airports and their architecture offer a chance to engage with the notions of place, nationality and history whilst still operating as high- tech factories for the safe processing of passengers in an increasingly unstable global environment.